Russian experts compiled a list of the main international policy issues that the presidents can agree on, not necessarily during the first discussion, but in the foreseeable future. 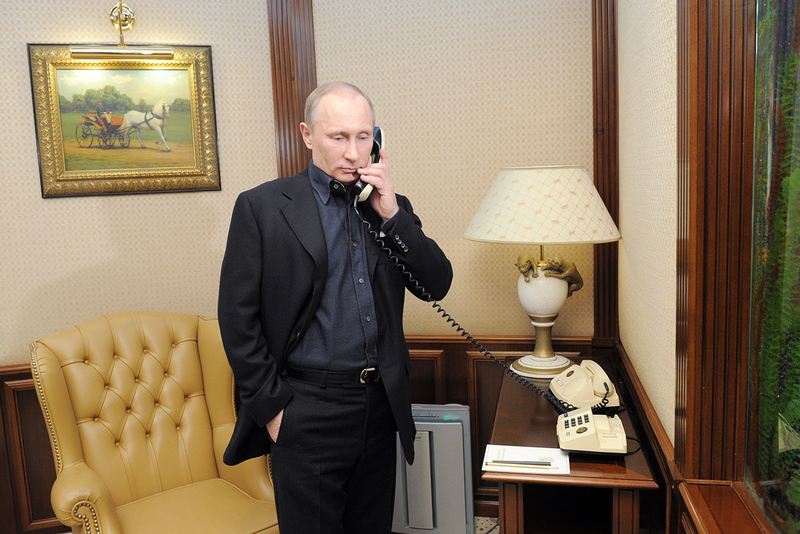 Photo: Vladimir Putin speaks by phone. Tomorrow’s first telephone conversation between U.S. President Donald Trump and Russian President Vladimir Putin will be historic. While the exact issues to be discussed are not known, RBTH has made a list of what will probably be discussed - Syria, sanctions, nuclear weapons, and more. Today, Russian Presidential Press Secretary Dmitri Peskov confirmed that Vladimir Putin and Donald Trump will speak on the phone tomorrow, Jan. 28. This will be their first conversation since Trump's inauguration. The last time Putin spoke to Trump was on Nov. 9, immediately after the latter's election victory. Russian experts compiled a list of the main international policy issues that the presidents can agree on, not necessarily during the first discussion, but in the foreseeable future. Donald Trump has often spoken about his determination to fight the Islamic State (IS) in Iraq and Syria, in collaboration with Russia. On Jan. 24, White House Press Secretary Sean Spicer confirmed the Trump administration's willingness to cooperate with any country in the fight against IS, including Russia. Experts noted that the joint fight on terror in Syria will most likely be one of the key issues during the Putin and Trump discussion. Leonid Isaev, senior professor at the HSE Department of Political Science, said that judging by Trump's statements, he plans to act pragmatically in Syria. "Trump's statement on creating zones of responsibility in Syria basically correlates to the country’s division into spheres of influence for Russia, Turkey and Iran that was formulated in December," said Isaev, adding that most likely the U.S. will preserve its influence in areas controlled by the Kurds, not trying to overthrow Assad or have Iran withdraw its forces. Trump has discussed the issue of lifting sanctions on Russia. The U.S. president suggested linking it to nuclear disarmament. However, Russia is skeptical of this idea, and the Russian presidential press secretary said, "it’s unlikely." Nevertheless, the way Trump formulated the question is rather interesting, remarked Professor Andrei Sushentsov, program director of the Valdai International Discussion Club and MGIMO. "The new administration is not tying the sanctions issue to the Ukrainian crisis and the question of Crimea's status," said Sushentsov. "This is obviously positive for bilateral relations." Recently there have been rumors that Trump has already prepared an order to lift sanctions on Russia. The Kremlin, however, has officially said it does not know anything about this. The preservation of strategic stability, including in the sphere of nuclear weapons, is another important subject matter for Putin and Trump, said Sergei Karaganov, honorary chairman of the Council on Foreign and Defense Policy. In his view, Russia and the U.S., along with other nuclear powers, must find a new approach in the sphere of nuclear security, "which would be based not on the reduction or increase of nuclear arsenals, but on the preservation of the global status quo." Such an approach would stabilize the world better than attempts to sign new disarmament treaties, which in the event of unsuccessful talks, can only worsen relations, as was the case during the Obama administration. Sergei Karaganov also believes that Putin and Trump can agree to end Russia-NATO tension in Eastern Europe. This is possible because Trump, unlike his predecessor, is not a keen supporter of Ukraine in its conflict with Russia. "We freeze the situation on a bilateral basis, including in Ukraine, and agree to contacts between NATO's military and Russia with the aim of freeing ourselves from this completely useless, artificial confrontation," said Karaganov, describing the most optimistic scenario. However, the expert admits that time is needed to solve these problems and one conversation between Putin and Trump is not enough. Another issue on which Russia and the U.S. can find a compromise is the problem of Russian citizens Viktor Bout and Konstantin Yaroshenko, who are in American jails. Bout was given a jail sentence after his arrest in Bangkok in 2008, and was charged with illegally trading weapons. Yaroshenko was detained by U.S. special forces in Liberia in 2010 and charged with drug contraband. Russia has demanded the extradition of its citizens on many occasions, but unsuccessfully. Andrei Sushentsov remarked that Trump, after discussing the situation with Putin, can indeed send the Russians back home - a presidential order would be enough. "Movement in this direction already began with Obama and I think that Trump's reputation will not suffer if this issue continues moving," said Sushentsov.